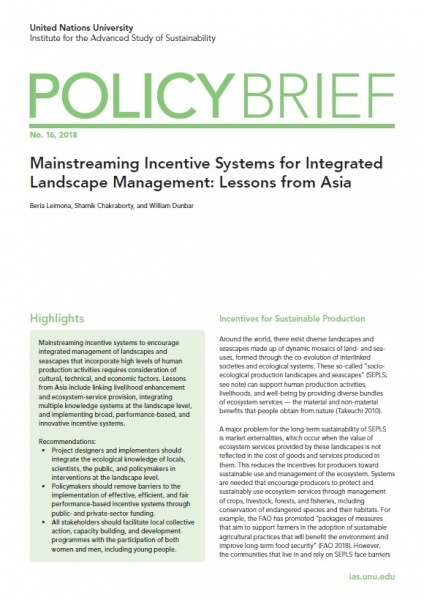 This month’s newsletter features two new publications: the full report from the first phase of the research project on integrated approaches in production landscapes and seascapes in the development and implementation of NBSAPs; and a recent Policy Brief on incentive systems for integrated landscape management from UNU-IAS. 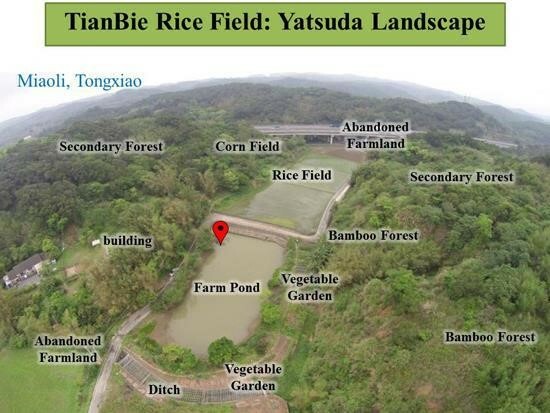 We also have reports from two recent events, a consolidation workshop for the “GEF-Satoyama Project”, and a recent conference on eco-friendly farming in Chinese Taipei. We would also like to share one of our more recent case studies on eco-friendly farming from our partner Observer Ecological Consultant. We would also like to remind readers of the 7th IPSI Global Conference (IPSI-7), which will be held in Kanazawa, Ishikawa Prefecture, Japan from 30 September to 2 October. IPSI-7 will be co-organized by the IPSI Secretariat and the Ministry of the Environment of Japan, and hosted by the Ishikawa Prefectural Government. Please watch this newsletter and the IPSI website for details. 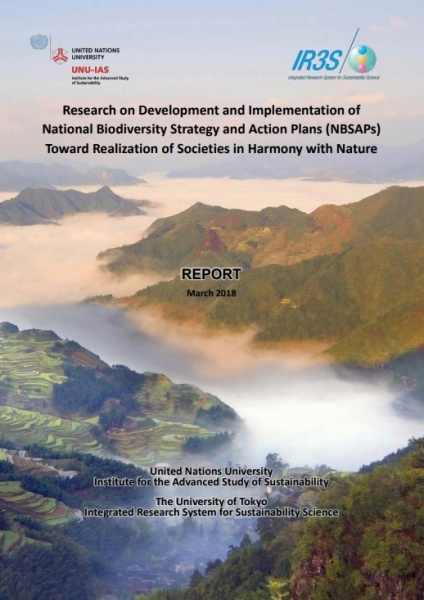 The United Nations University Institute for the Advanced Study of Sustainability (UNU-IAS) and the University of Tokyo Integrated Research System for Sustainability Science (UT-IR3S) recently published the full report from “a two-year research project from 2016 to 2018 to review and analyze existing National Biodiversity Strategies and Action Plans (NBSAPs), examining how integrated approaches in production landscapes and seascapes are incorporated into NBSAPs, and how countries implement NBSAPs, other relevant policies and projects by conducting literature review and analysis, and holding the international workshop.” This research project, an IPSI collaborative activity, aims to identify experiences and lessons learned and key messages to be shared with CBD parties to support future NBSAP revisions and policy development. 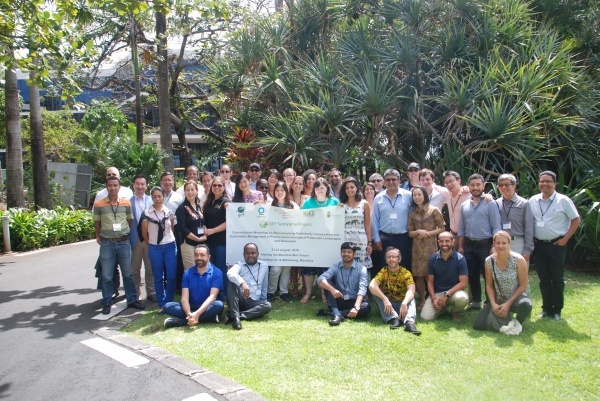 A “Consolidation Workshop on Mainstreaming Biodiversity Conservation and Sustainable Management in Priority Socio-ecological Production Landscapes and Seascapes” was held under the “GEF-Satoyama Project“, 21-24 August in Plaine Magnien, Mauritius. The GEF-Satoyama Project is an IPSI collaborative activity with a number of components including providing support for on-the-ground projects in priority SEPLS in biodiversity hotspots around the world over the past few years. This workshop was held “to consolidate lessons learned under the Project to generate information/knowledge products”, and brought together representatives from each of the 10 subgrant projects and other experts for in-depth discussions. It also included a session on the “Indicators of Resilience in SEPLS“, which were used in the subgrant projects, and an excursion to the project site of sugrantee Environmental Protection & Conservation Organisation (EPCO). Outcomes from the workshop will be compiled and disseminated through IPSI’s network and other relevant fora. For more information, see the GEF-Satoyama Project website here. The “2018 International Conference on Eco-Friendly Farming and Farmland Ecology” was held August 17 to 19 at the National University of Taiwan in Chinese Taipei. The conference was organized by IPSI members Tse Xin Organic Agriculture Foundation and the Forestry Bureau to discuss practical solutions for sustainable development through eco-friendly agriculture. Nearly 600 people participated in the event. Dr. Evonne Yiu of the IPSI Secretariat was invited to speak on the Satoyama Initiative and Globally Important Agricultural Heritage Systems (GIAHS) on the third day of the conference, illustrating how agricultural biodiversity and agro-ecology could be improved through conservation of agricultural heritage in SEPLS and GIAHS, and encouraging reflections on the importance of inheritance and sustainable management. Dr. Rajarshi Dasgupta of the Institute for Global Environmental Strategies (IGES) also introduced the Satoyama Development Mechanism (SDM)and shared research analysis of how SDM projects contributed to Aichi Biodiversity Targets and SDGs from economic, social, information, management, and innovation aspects. The IPSI Secretariat recently received a case study from partner organization Observer Ecological Consultant Company in Chinese Taipei, titled “Conserving the giant water bug (Lethocerus indicus) by eco-friendly farming”. The giant water bug (Lethocerus indicus) is a species native to Taiwan, which is facing extinction owing to environmental change. The insect and eggs were found in a pond next to a paddy field in Tongxiao Township, Miaoli County. To conserve this rare water bug, farmers were encouraged to apply eco-friendly farming methods by contract farming and community support. Many practices are being conducted to achieve sustainable development and the Satoyama Initiative in local agricultural production, such as monitoring the leopard cat and the small Indian civet, improving pond quality as a habitat for the giant water bug, and recovering rare plants along footpaths between paddy fields.